One of the biggest changes in the latest version of Office is the new Back Stage view which replaces the Office menu you saw in Office 2007. Back Stage view gives you an at a glance overview of the entire document, and provides a richer editing experience. While most of the document editing functions are grouped by specific functionality in the Ribbon toolbars, the Back Stage view provides you with access to functions that affect the entire document. Like document properties, versioning, document statistics, protection and more. You can still use the usual commands like Open, Save, New (with a newer interface screenshot above), etc. The new document view lets you open the installed templates on your computer or browse them directly on Microsoft Office Live. You can search for something specific if you want to. My favorite new addition here is the combined Print Preview and Print Setup options. You can change print settings and get a glance of how they would affect the document. New Share features provide you with one click email options as well as saving to PDF and XPS formats. 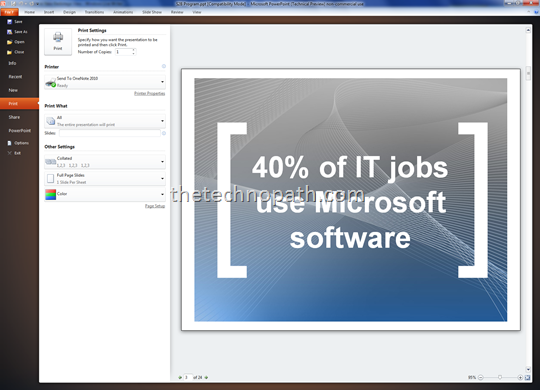 Specific to PowerPoint, you can also create a video of your entire presentation which will save as a WMV file. The video can contain all the transitions, effects, narrations and gestures you have recorded. Iâ€™ll post a more detailed post on this later. This post is a part of a series of posts on the new features in Microsoft Office 2010 Beta. You can read about other new features of Office 2010 that I have already posted, or subscribe to the blog for more updates. Have an interesting feature you discovered? Iâ€™d love to hear it via the comments. Ran 43 queries in 0.247 seconds.